174 pages | 1 B/W Illus. 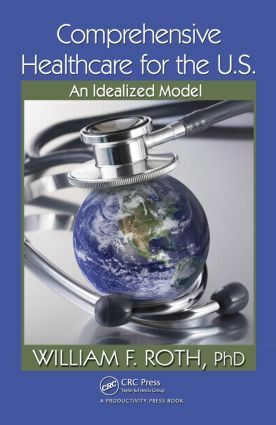 Three years in its creation, Comprehensive Healthcare for the U.S.: An Idealized Model brings together contributions from physicians, nurses, administrators, and social workers from around the globe to critically examine the mire of excellent technical quality and inefficient delivery that has become the United States healthcare system. Written by award-winning author William Roth, the book systematically explores the key elements that must be part of any comprehensive model. Roth examines facility network and staffing patterns. He looks at approaches to decision making, the financial model, the design of a universal information system, training/education, and malpractice policy. He then provides a discussion of how these challenges are dealt with by 12 other nations, all of which, according to the World Health Organization, rank higher than the U.S.in terms of services provided for citizens. Roth tackles the larger philosophical issues and their connection to the specifics without obscuring the discussion with excessive statistics. He systematically shreds the inflammatory political rhetoric that is often used to shut down intelligent debate. He explores what it might take to make comprehensive care available to all, ways to shift our focus to wellness and prevention, the overuse of and lack of incentive for providers in universal systems, though some form of universal care is necessary, as well as the key role that the private sector must play in any approach. From there, the author draws from the best to design an idealized model for comprehensive healthcare that would fit the unique requirements of the United States. Referenced and researched to satisfy the needs of policy professionals and sector administrators, the book is lucidly written so that it provides all stakeholders with a more complete grasp of the involved problems as well as of the proven solutions that can be put into place once we understand their value and their viability. … the book will help readers understand the current state of the US health care system, as well as the state of other countries to which the United States is often compared. … useful for policy makers as well as for graduate students in various health care and related fields. … the book provides a starting point for discussions about US health care reform without the emotional misrepresentations that are, unfortunately, a part of the debate about health care in this country. The book closes with recognition that although the idealized model is not likely to be fully implemented, it provides a standard by which to measure and shape health care reform in the US. The work is somewhat distinctive in the recent flood of books dealing with health care reform in that the author is not a health care specialist but a systems analyst. Chapter 2 The Current US Healthcare "Mess"